Black Friday Tidal deal: 3 months for just 99p | What Hi-Fi? Tidal, our favourite music streaming service, has just announced its brilliant Black Friday deal, which gets you three months membership from as little as 99p. There are two options: three months of Tidal Premium for 99p (normally £9.99/month) for unlimited streaming of songs in 'standard' quality, or three months of Tidal HiFi for £1.99 (normally £19.99/month) for unlimited streaming of CD-quality streams and hi-res Masters. That equates to savings of up to £58. We know which we'd go for! As Tidal won the What Hi-Fi? Awards 2018 Product of the Year for accolade for the 'Best Streaming Service', this is a really hot deal and should sway some Spotify subscribers - temporarily at least. Tidal is one of the few music services to offer CD quality and hi-res audio options, and support for it on hardware platforms is only going north. 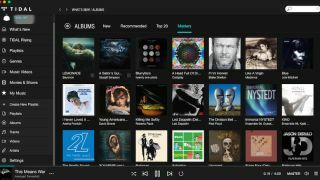 Hi-Fi tier subscribers using the Tidal desktop app can take advantage of Tidal's 24-bit, MQA-encoded Masters streams, too. On top of that there is also plenty of curated content, music videos in HD, and more. If you don't have a streaming service yet, or haven't tried hi-res audio, this is a great chance to give it a go while it costs next to nothing. Do note, though, that these memberships will continue at the usual monthly rate of charge after the first three months.